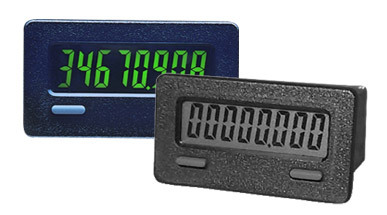 The CUB7 series is an 8-digit lithium battery powered miniature counter or timer with large 0.35" (8.9 mm) high digits. It has an LCD read-out available in Positive Image Reflective, Negative Image Tran missive with yellow/green or red back lighting. The back light versions require an external 6-20 VDC power supply. The CUB7 series is housed in a light weight, high impact plastic case with a clear viewing window. The sealed front panel with silicon rubber keypad meets NEMA 4X/IP65 specifications for wash-down and/or dusty environments, when properly installed with supplied panel gasket and mounting clip. Both counter and timer CUB7 models are available with a low voltage input (28 VDC max) and an isolated high voltage input (50-250 VDC/VAC). The low voltage input has DIP switch selection for SINKING or SOURCING along with HIGH/LOW FREQUENCY selection (low frequency for contact inputs). Both units have front panel keypads that can be used to reset the display. The keypad can be enabled / disabled via a single DIP switch. The standard unit uses 22 gauge wires for external connections; an optional plug-in terminal block is available. With a dimension of 28.0 x 50.8 x 41.6 mm, the CUB7 is the smallest in its class.